(CNS): As investigations into the unexplained killing of 35-year-old Patrick Leonard Williamson, a.k.a. ‘Carlos’, continue, the police are asking anyone who saw him or his car on Friday night Saturday morning to come forward. The Jamaican national, who was working and living in Cayman, was last seen alive at around 3:30 on Saturday morning in the vicinity of Eastern Avenue and Courts Road, where he had dropped off friends and was close to where he also lived. 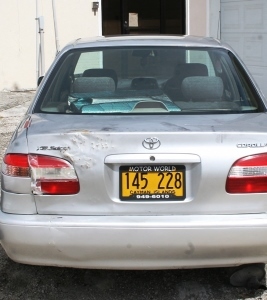 Williamson was driving a silver Toyota Corolla 145 228 (left) and had been out with friends to a number of George Town bars, including Meringue Town, Bananas and Nectar. Detectives believe Williamson was involved in an argument with another man at the last bar and they are appealing for anyone who was at Nectar and witnessed it to call the police. Williamson was reported missing on Sunday and his body was discovered by the landowner and recovered from a pond behind his home in Spruce Lane at around 7:00 Monday morning. Although the police have not yet stated a cause of death, they are treating his death as suspicious and have begun a murder investigation. Williamson has no known connections to any criminality and police say they are following a number of lines of enquiry as they try to piece together Williamson’s final moments before his death. No arrests have been made in the case so far. Information can be passed to George Town police station 949-4222, the RCIPS tip line 949-7777 or Crime Stoppers 800-8477(TIPS). Now I know why they call these cameras "CLOSED CIRCUIT" they are never open! These are favourite haunts of our MLAs. Maybe one of them saw him. This was in George Town. Some areas mentioned are either business, residential, or higher crime are. Why is there not captured footage by our CCTV systems. With this system any investigation should be able to develope a time line on his whereabouts. I would like to think that for the sake of the integrity of the investigation that this information is being withdrawn from press realeases but we often see that it is just that they don’t have it. Regarding statistics it is not relevance where we are on the crime spectrum. The situation looks dire and has the appearance of a crime plagued society. We will soon not have to worry about permits as there will be no flock of quality persons looking to relocating here. We have another brutal murder that appears to have no leads to convictions. Like it or not this is fact. Godbless this man and pray endlessly for his family. While you are at pray for our community as we live amongst some heartless hardened people without much considered or morality. While I am in sympathy for this poor felllow and his family this crime plagued society that you are speaking of has gotten to be like this since we have so many people here on w.ermits. Why do you think that so many people came here and continue to do so?t was merely because we had a crime free society.This is what we Caymanians are so disgruntled about. If some of these criminals return to their home then we would only have to deal with our own mess. Unfortunately we have inherited alot of crime that costs us so much. Ever heard of the cost per annum at the Northward prison? Check it out…. I'm pretty sure that they are joking. I mean who would they expect to help them after last weeks article on a failed witness protection scheme? Why are we paying for CCTV's??? Have they really really solved any crimes in Cayman???? So the cctv cameras aren't working…….???? Uhh, Nectar has video cameras so.. why not request that they release footage of that night? Doh! I had my trusty "I need for resources" speech readyto go too. They should have cameras but, you know the usual story…..theywere out of order on that particuar night. I wouldn't be surprised that this man fell victim to the same group of latino males that frequents this club and are constantly getting into fights or arguments there. On one occasion I witnessed this group swarm an expat that works at a local law firm and it was all over foolishness. It was clear the expat wanted no problems and tried to leave the premises but, this group of bullies prevented him from doing so by following him to the parking lot and would've probably injured him there if other individuals didn't step in. The police needs to look into this latino group further because it seems as if its the same group of morons that wants to beat or kill any Caymanian or another nationality of man that shows up to this club and either looks at them in a funny way, says hi to any of their women that works or goes there or accidentally bumps into any of them. Yes, I'm sure that I will get alot of angry responses because I am referring to this particular group knowing where they come from and yes, I know that Caymanians are guilty of the same behaviour but, these are the facts. They are a bunch of wicked guys who brought their dirty and jealous ways here with them and Lord helps any other man (or woman) that goes to Nectar or any other latino club here with a wandering eye or fail to walk straight because it would appear that you will now lose your life over it. Uh….Hello??!! The Latinos ARE being looked at. That is exactly what the writer is trying to get across. Maybe Caymanians and Jamaicans are being blamed for alot that is happening and your people are being bypassed. In plain English…..WE ARE LOOKING AND WILL CONTINUE LOOKING! Yes that's correct, and there are also street (CIG owned) cameras along Eastern Avenue. I am sure Cox Lumber probably has external cameras that may have caught something on them too. Truly hoping that the person(s) responsible are apprehended and charged asap! Definitely don't need this type of aggression rolling around the rest of us. Condolences to Mr. Williamson's family and friends.